LONDON -- The whistleblower at the heart of the Facebook privacy scandal has testified before British lawmakers investigating the increasing rise of fake news. Christopher Wylie has alleged that Cambridge Analytica harvested details of 50 million Facebook users and used the material in U.S. President Donald Trump's 2016 election campaign. It is alleged the material made it possible to micro-target users with campaign material. Wylie told lawmakers on Tuesday that Canadian company AggregateIQ worked on software designed to identify Republican voters ahead of the U.S. presidential election in 2016. "There's now tangible proof in the public domain that AIQ actually built Ripon, which is the software that utilized the algorithms from the Facebook data," Wylie said. AggregateIQ told Reuters on Saturday that it had never worked with Cambridge Analytica. On Tuesday, Cambrige Analytica released a statement, asserting Wylie would have "no direct knowledge of our work or practices" since July 2014. Christopher Wylie was a part-time contractor who left in July 2014 and has no direct knowledge of our work or practices since that date. Meanwhile, the BBC and others reported that Facebook CEO Mark Zuckerberg would not testify before British lawmakers about the scandal. Zuckerberg was instead planning to send his Chief Technology Officer Mike Schroepfer or Chief Product Officer Chris Cox to appear before the U.K. parliamentary committee, according to a letter, seen by various media outlets, sent from Facebook to the British Parliament. The chair of the investigating committee called Zuckerberg's refusal to appear "absolutely astonishing," and urged him to reconsider. 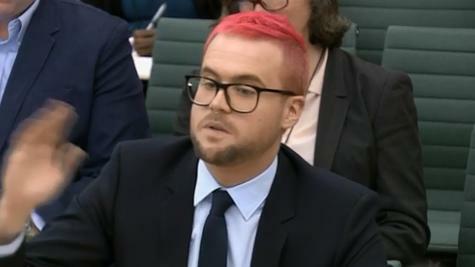 Asked by one British parliamentarian whether he felt Zuckerberg should appear in London to answer lawmakers' questions, Wylie said, "Well, I'm here. I made my involvement known and have taken my share of responsibility -- and tried to make amends anyway that I can... I've spent, I think, the better part of year trying to work on this. Given the reaction to this story, having a meeting is the least that you can do." In the U.S., Wylie has agreed to Democrats' requests to testify before and provide documents to the House Intelligence Committee. Democrats had struck a defiant stance after Republicans' announcement last week. A lawyer for Wylie confirmed to CBS News that Wylie would appear and that the committee had been duly informed of his intention to do so. Committee officials said they were expecting both testimony and documents from Wylie in the coming weeks.